Sometimes you get a perfect storm of small crises that overwhelm you. Sometimes you get one big wallop. But it’s absolutely a normal experience to find yourself over your head and struggling to breathe. It doesn’t even have to be all bad things. Some of my most stressful days have involved dreams come true or totally ordinary life passages. A wedding or your baby’s first day of school can be a big dump of stress. So, what do you do? There are two possibilities, and you will probably do both of them, in different ways, if you’re going to get through it with the minimum possible damage. You know how your Doctor tells you to alternate ice and heat for a sprain? I’m going to say, alternate between collapsing and persevering. It is perfectly okay to crash a bit. As Opus the penguin used to say, it’s time for a Dandelion Break. Find your safe place or safe person, and don’t cope with anything. Let it all wait while you figure out which way is up. And then, cope. It’s the flip side, with it’s own cartoon mascot- Dory from Finding Nemo. 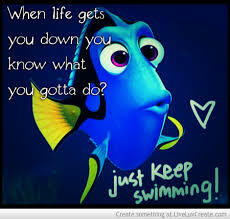 Just keep swimming. This is the time to use all those skills and connections you were building during the good times. (Note: If this is a good time, what are you doing to be ready for the bad days?) And then, when the coping is too hard, crash again. And then get up and cope again. It sounds ridiculously simple, but the key point here is to alternate. If you get stuck in a collapse, it will be extremely difficult to get activated again. If you get stuck in too much coping, you will eventually break down, and it will not be pretty. So, do give yourself permission for time-limited periods of feeling the pain. And do make use of denial and perseverence and all of the other coping skills you’ve got. As I think about it, my Doctor doesn’t just say to alternate heat and cold, He says to use RICE: Rest, Ice, Compression and Elevation. and, do not forget to Elevate- transcend the stress by connecting with your spiritual beliefs. Interesting. It turns out that First Aid for Body and for Soul is more similar than I ever would have guessed! Does this make sense to you? It’s easy to say, hard to do. How do you like to safely collapse? How do you actively cope? And how do you manage to switch between the two extremes?